Premenstrual Syndrome (PMS) is distressing for up to 20% of women of reproductive age. Premenstrual Dysphoric Disorder (PMDD) is more severe than PMS and affects 5-10% of women during their reproductive years. The term “PMDD” is reserved for cases meeting strictly defined criteria, mostly psychiatric, that lead to periodic interference with day-to-day activities and interpersonal relationships. We now know that PMDD affects women at all stages of reproductive life (including teens). PMDD is not found during times when the menstrual cycle is suppressed, such as during pregnancy or breastfeeding or after menopause. The emotional disturbances are significant enough to cause problems with daily life. For the diagnosis of PMDD, five or more of these symptoms recur monthly the week before menstruation starts and disappear a few days after the period begins for the majority of the reproductive years. 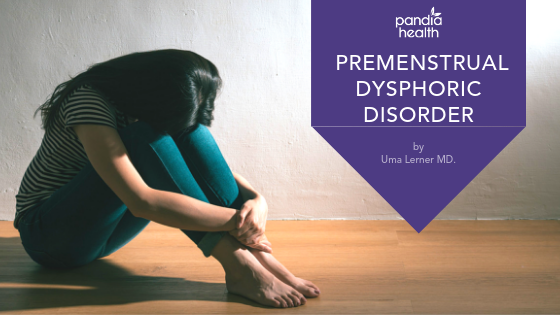 For women with premenstrual dysphoric disorder, the symptoms can be as disabling as major depressive disorder. It has been estimated that each women with PMDD experiences almost 3,000 days of severe symptoms during her reproductive years. Also, many women experience worsening of major depressive disorder and anxiety disorders in the days preceding their period. An estimated 40% of women who seek treatment for PMDD actually have a premenstrual worsening of an undiagnosed mood disorder rather than PMDD. Therefore, it is important to be carefully evaluated for the presence of an underlying mood disorder in order to develop the best treatment plan. Because many of the symptoms of PMDD are the same as those experienced by women with other psychiatric disorders, the on-off nature of symptoms occurring during the time between ovulation and menstruation is the key to diagnosis. A symptom diary over a few menstrual cycles can be immensely helpful in making the right diagnosis. Anticipating times when you will be affected can be empowering in giving you knowledge of your body and options for managing life events and self-care. Normal estrogen levels vary widely. Large differences are typical in a woman on different days, or between two women on the same day of their cycles. The actual measured level of estrogen doesn’t predict mood. Reproductive hormones, genetic predisposition, and psychological stress may all contribute to the experience of premenstrual symptoms. After searching for differences in circulating hormone levels between affected and unaffected women, experts have reached the conclusion that it is differing neuronal sensitivity to normal hormonal changes, rather than the levels of hormones themselves, that causes PMDD. For some women, exercise and other lifestyle interventions can help with PMS or PMDD symptoms. Women with moderate PMS or PMDD may opt for seeking psychological treatments, such as cognitive behavioral therapy (CBT). For those with severe PMDD, pharmacotherapy (medication) is often recommended. There are several studies of various antidepressants for PMDD. In most cases, antidepressants were used continuously, but in some other studies antidepressants were administered intermittently (only between ovulation and menstruation) or were even only used with the onset of PMS or PMDD symptoms. Combined hormonal contraceptives have been found to be significantly helpful to women reporting PMDD. Studies have also looked at extended cycle birth control, where women take hormone pills continuously through the 28-day cycle, without a week of inactive pills. This may be an excellent first choice for premenstrual symptoms. The use of hormonal contraceptives continuously has also been shown to be a useful strategy for women treated for depression who have premenstrual worsening of mood symptoms even on antidepressants. The addition of hormonal contraceptives often leads to a significant improvement in these symptoms without needing to increase antidepressant dosing. In one study of the use of extended cycle birth control, 41–86% of women experienced an improvement in their PMDD symptoms. Nearly 2/3 of women in that study continued with the extended birth control regimen. Of the women who continued the regimen, 94% reported improvements in their quality of life. In a review of four studies, which evaluated extended cycle birth control in managing PMDD, continuous hormone use showed an improvement in premenstrual symptoms ranging from 30% to 59% in controlled trials and 56% to 81% in an open-label study. This data indicates that continuous birth control may reduce the symptoms of PMDD and PMS, providing an option for women to manage the physical, psychological and behavioral symptoms and loss of work productivity related to PMDD.